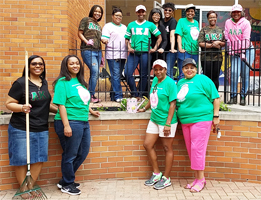 On Saturday, May 26, 2018, members of the Zeta Alpha Omega Chapter of Alpha Kappa Alpha Sorority Incorporated® participated in the Community Impact Day for 1908 Playground Mobilization Day. The event was held at the YWCA Northwest Ohio. The project involved the members refreshing the playground equipment and restoring the flower beds with new plantings of flowers and mulch. 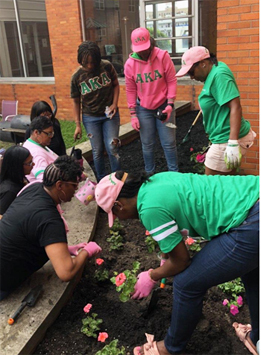 The chapter was excited to assist with the additions and improvements that Zeta Alpha Omega donated to the park. “This place is special and plays a vital role in our community. This was our way of giving back to the families and the staff here at the YWCA,” said Chairman, Cheryl Phillips. The project was overseen by the chapter’s Environmental Ownership Committee. Playground Mobilization Days are part of a global campaign, started by the first sorority for African-American women. The goal of the initiative is to ensure that children have safe and inviting places to play by restoring, refreshing, and renewing 1,908 playgrounds internationally.